I have a compiler set, please see the attached screen shot. Why the heck am I returning the following each time I type Ctrl+F9 (Make Project)? I have restarted IntelliJ once already. Do you have this JDK configured for the project? 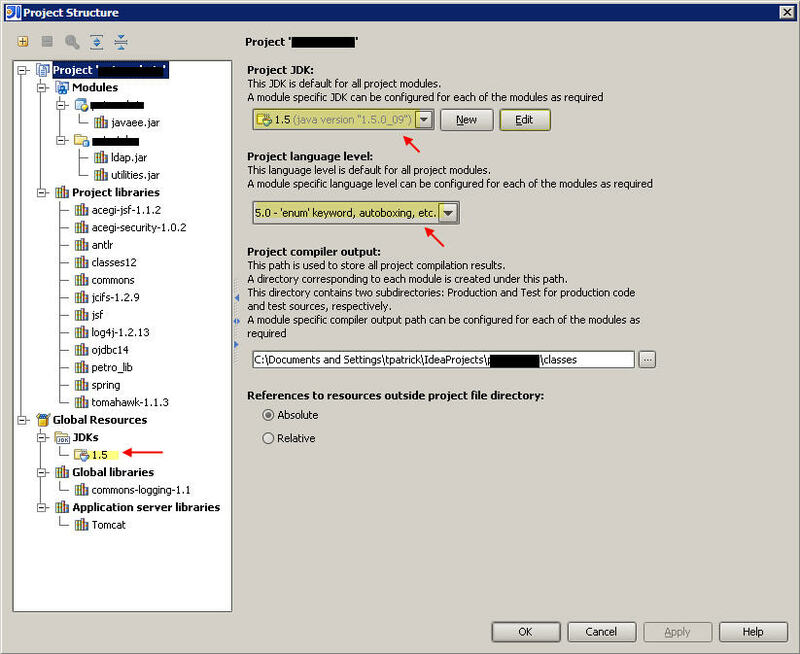 The screenshot shows that you have it configured for IDEA, but you must also choose it for the project, click on the project root node and specify the Project JDK. Serge: I believe that I have done that. Please see the new screen shot attached. I have seen this also. I can't reproduce it consistently though. Try IDEA 6.0.2 from EAP. If it doesn't help, reinstall the JDK, make the new JDK configuration in IDEA. I reinstalled the JDK. I now am running 1.5.0_09. Please see my latest screen shot. _I still have the same error. This has wasted an entire six hours of development time and since I am a paid customer, I was wondering if there was any U.S. phone support or what are my support options? Have you tried IDEA 6.0.2? See here: http://jetbrains.net/confluence/display/IDEADEV/6.0.2+EAP . We don't have phone support, support is provided here: http://www.jetbrains.com/support/idea/index.html . Can you reproduce this problem with any project or only with this particular one? I don't understand why all of a sudden this would happen? Another thing that you can try is renaming USER_HOME\.IntelliJIdea60 directory and starting with the clean profile. This can help if some configuration has broken. "Run Jasper validator for JSP files" in my web module build settings. Can you reproduce it with any project like Todd or not? Even when there are no web modules in the project? Anything specific in your configuration? Well, if there's no web modules then there's no "Run Jasper validator..."
checkbox so, no I can't reproduce in projects without web modules. debug jsps and I was getting this error before that). Todd, do you build/deploy with IDEA or Ant? are no web modules in the project? At the office, I use IntelliJ to build/deploy to our development environment only and I promote my projects with the Ant script though our project process. At home, all of my projects at any stage are built/deployed with IntelliJ. don't get the error if I select "Run Jasper validator..." with that project. error. Hope that's enough to help. >> are no web modules in the project? >> Anything specific in your configuration? I need more information to reproduce the problem. Please put the following lines into /jre/lib/logging.properties file: org.apache.jasper.JspCompilationContext.handlers=java.util.logging.FileHandler org.apache.jasper.JspCompilationContext.level=ALL Then reproduce the problem and post here ]]>/java0.log file. deploy. I don't get the error if I select "Run Jasper validator..."
>> checkbox so, no I can't reproduce in projects without web modules. >> debug jsps and I was getting this error before that). >> Todd, do you build/deploy with IDEA or Ant? >>> there are no web modules in the project? >>> Anything specific in your configuration? don't see a java0.log file anywhere. Then reproduce the problem and post here <USER_HOME>/java0.log file. >> deploy. I don't get the error if I select "Run Jasper validator..."
>>> checkbox so, no I can't reproduce in projects without web modules. >>> debug jsps and I was getting this error before that). >>> Todd, do you build/deploy with IDEA or Ant? >>>> there are no web modules in the project? >>>> Anything specific in your configuration? Looks like you have log4j.jar in classpath of your module so commons-logging uses log4j's loggers instead of JDK's loggers. Please create directory "dir" in ]]>/lib/rt/jasper2 and put the attached commons-logging.properties file into the created directory. Then repeat steps described in my previous comment. I don't see a java0.log file anywhere. >> I need more information to reproduce the problem. Attachment not added (general error): "commons-logging.properties"
The latest build (6077) seems to have fixed the problem. Thanks. repeat steps described in my previous comment. I'm still having this problem with IDEA 6.0.4 (build 6148). It's a web module that is being deployed to a JBoss server. Unchecking the "Run Jasper validation" does fix the issue. Do I need to open a JIRA for this? 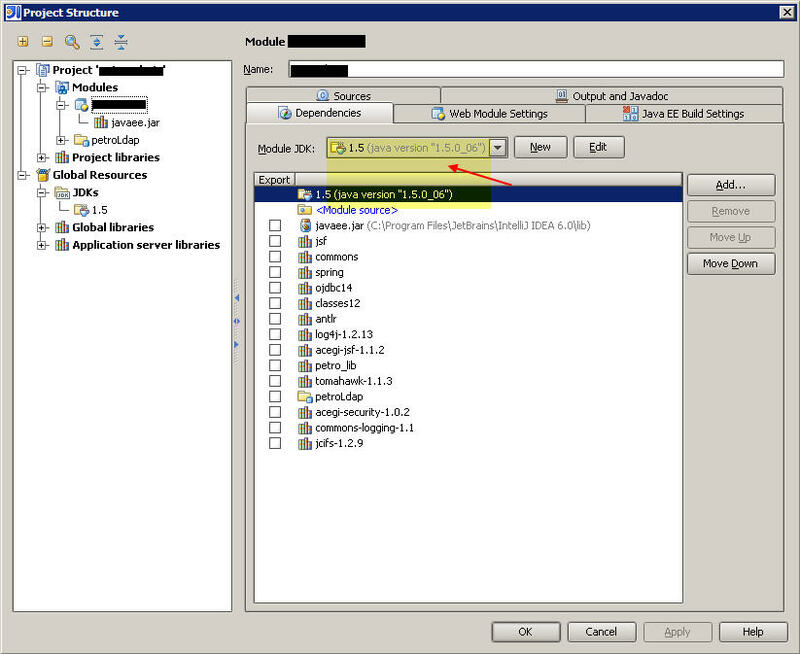 web module that is being deployed to a JBoss server. to open a JIRA for this? Project with a web module with "create exploded" unselected and "run jasper validation" selected gives the "no compiler" message. brad,How about solving it in netbeans? solve what? It works as it should. I can load the JSP in TOMCAT,while it give the message"no java compiler availabel" after I install JWSDP.